Sustainable procurement is the procurement that has the most positive environmental, social and economic impacts possible across the entire life cycle and that strives to minimize adverse impacts. Sustainable Public Procurement is Sustainable Procurement made by public organizations. A process whereby public organizations meet their needs for goods, services, works and utilities in a way that achieves value for money on a whole life cycle basis in terms of generating benefits not only to the organization, but also to society and the economy, whilst significantly reducing negative impacts on the environment. In this page there are resources that provide an overview of sustainable procurement, its principles and core subjects. It has also general SPP materials such as manuals, brochures and presentations, descriptions of some SPP initiatives as well resources about concepts and practices. The alignment of SPP initiatives with broader sustainability policies and strategies is important. Also, it is important the articulation of sustainable procurement policy and strategies with those broader policies. Legislation has an important role in SPP, both specific legislation and regulations that sets or applies to SPP and other legislation, policies and strategies that can affect SPP. In this page there are resources related with the SPP strategies, policies, action plans, SPP and other legislation and other relevant aspects related with the implementation of SPP initiatives. SPP Governance encompasses the organizational conditions and management techniques needed to successfully implement and continually improve SPP. These are conditions and practices that assist and support the implementation and ongoing maintenance of SPP and pertain the organization and also refer to the relation with the stakeholders, with particular importance to the supply chain. They do not address the procurement process itself, which is the subject in the Procurement Process. In this page there are resources related to the better governance of SPP. The procurement process encompasses a cycle of several steps and activities from planning to awarding and reviewing and learning from the process. The aim of SPP is to integrate sustainability into the existing activities within the public procurement process. In this page there are resources related to the steps of the procurement process and the activities carried out to integrate sustainability in its cycle. Specifications with sustainability criteria are crucial to SPP. They are product or service specific and associated with them there are the considerations of means of verification to verify if a product or service comply with the specifications or other relevant tender documents with requirements. In this page there are specifications for products and services and, where available, the related means of verification associated. This page follows the classification of products and services as established in the ISIC Rev.4 - International Standard Industrial Classification of All Economic Activities, Rev.4. The specifications that are available here were provided by the governments and other organizations practicing SPP. Criteria for products and services with sustainability requirements used by some initiatives of certification, labelling or other independent initiatives of means of verification, as well as voluntary sustainability standards are available at Means of Verification. Means of verification is a generic designation to procedures, practices and initiatives related to verify if goods or services comply with specified requirements. They encompass tools and activities such as sampling, inspections, testing, audits and the treatment and communication of its results, such as approvals, declarations of conformity, certificates, marks and labels. The activity of verifying if a product or service complies with preset requirements is called technically conformity assessment. The buyer (the organization who is making the procurement) or someone on its behalf, when is called 2nd party assessment. An independent organization, both from the buyer and the supplier, when it is called 3rd party assessment. In this page there are resources related to the means of verification in general terms, technical infrastructure related (such as related to standards, laboratories, metrologic systems, certification, accreditation, labelling, ecolabelling, voluntary sustainability standards systems and other claims) and related with specific initiatives of means of verification. 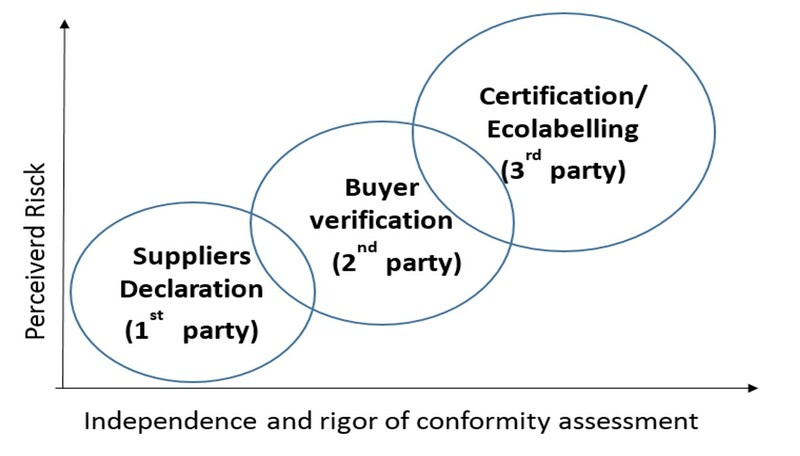 There are several initiatives that verify the conformity of products and services to specified requirements, including sustainability requirements, and provide information about this conformity. Third party initiatives that verify the conformity and declare publicly the results, usually by means of certificates, marks or labels are relevant for SPP. The availability of resources related to means of verification in this site does not imply the endorsement or recognition of those initiatives by the governments of the region.